When thoroughly lost a nice lady helped us find the wall that was bigger than life and a block long. It was the International Reformation Wall in Geneva, Switzerland which was built parallel to the ancient city wall below the University of Geneva that John Calvin started in 1559. The Reformation Wall with the key reformers in Geneva who influenced other reformers on their right and left (to the East and West in the world) for the centuries to come. The old city wall is behind it and the school Calvin started. Not seen are a large block on either end with Luther and Zwingli’s names on them. This wall depicted the impact of the protestant reformation by statues in bold relief. In the center were four key reformers in Geneva. Left to right was William Farel, a fiery minister who founded area churches. Next was John Calvin who was influenced by Farel to pastor God’s people rather than write books. Theodore Beza spread the movement to France. Finally, John Knox founded the Presbyterian church in Scotland. All were instrumental in bringing the church back to teaching Scripture and the doctrines of free grace rather Roman sacramentalism. The four key reformers from Geneva who impacted the world through the Reformation. “After darkness light” was inscribed by the images because most people were illiterate at the time. But, Calvin and Farel had established public schools so people could learn to read Scripture bringing real spiritual change to lives. To the left and right this monument has three smaller statues representing the continued impact of the reformation in Europe in one direction and America in the other. On the right was Roger Williams who established the first baptist church in America in Providence Rhode Island in 1638. He differed with the pilgrims who were wanting to purify the Church of England which was tied to the government; Williams was a Separatist wanting to separate from the Church of England which had become corrupt. He was a staunch advocate for religious freedom, separation of church and state, and fair dealings with the Indians. His beliefs were founded in Scripture and eventually adopted in our Constitution. Roger Williams on the left with the Mayflower Compact mural to the right of him depicting the impact in the New World (America) as they cited God’s leading in the venture. 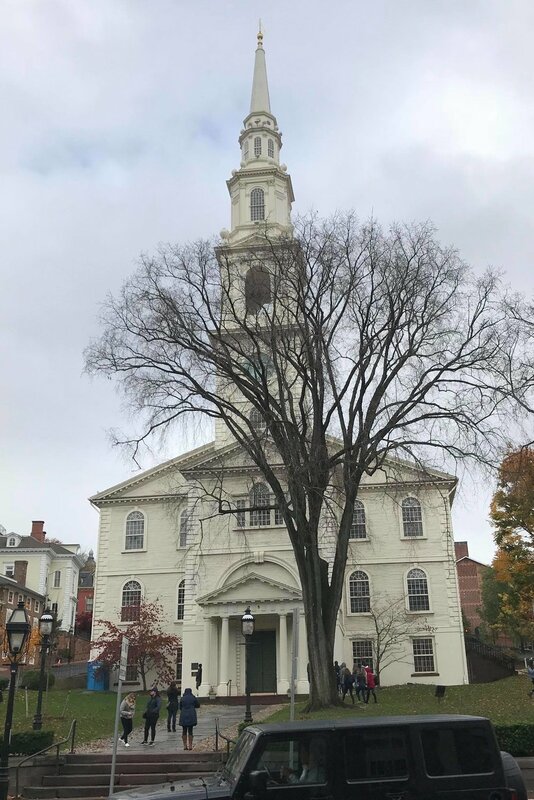 The first Baptist Church in America established in 1638 in Rhode Island by Roger Williams. Picture taken by my son Nehemiah a week ago while visiting there. What really caught my eye was the mural of the Pilgrims in stone next to Roger Williams. They were kneeling in prayer around a keg on the Mayflower. Above the picture the text of the Mayflower Compact (1620) is inscribed on the wall. It moved me to think in Switzerland there is a major piece of art depicting God’s hand in America (“God” is mentioned four time.). The Pilgrims clearly felt God had directed them here and later thanked Him even after loosing so much in the early days of their sojourn. They were simply an extension of what God had done in Europe. But it didn’t stop with the Pilgrims or Roger Williams. The Gospel still brings change in people’s lives wherever it is proclaimed. When it does it causes a deep sense of thankfulness for what God has, is and will continue to do in our lives, families and country. Let us give thanks to Him. Nancy and I want to say we are thankful for all of you and pray the Lord will bless you with a wonderful and deep sense of thanksgiving this year. Have a blessed Thanksgiving. P.S. No Sunday School this Sunday due to the Holiday.